Special Day digital scrapbook collection is for all of your special days whether it is your wedding, engagement, anniversary and all sorts of romantic celebrations. Airy colors and touch of green here and there makes it perfect for spring. Shop Special Day Elements by clicking "Add to Cart" button and start documenting your unique story today. Shown in preview at 80%-100% relative to 12x12 canvas. 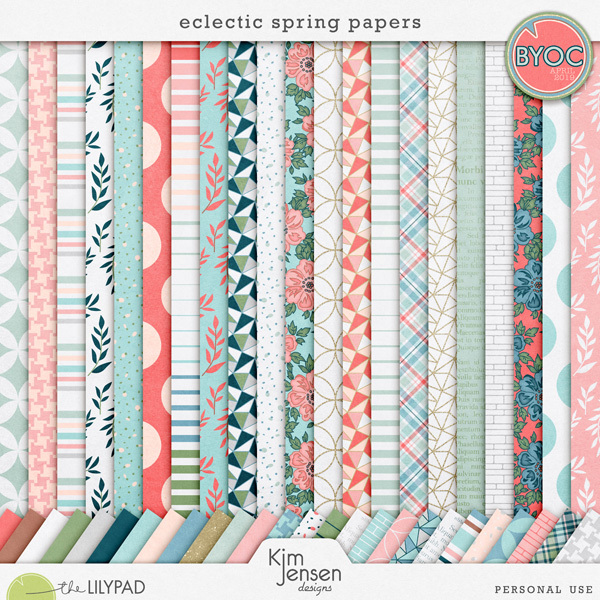 Designed to coordinate with my Eclectic Spring Papers and the rest of the April 2019 BYOC. These elements will help you keep the joy alive in your pages and in your heart this Easter season! 1 banner, 4 glass buttons, 4 flowers, 1 girl sticker, 3 journal tags, 1 vintage key sticker, 2 sets paper leaves, 1 bottle sticker, 2 word titles, 3 paint transfers, 7 phrase strips, 3 phrase snippets. These digital products have been saved at 300 dpi. Part of the April BYOC ("Build Your Own Collection") at The Lilypad, this collection of cute elements comprises: 1 banner, 3 bows, 2 epoxies, 3 flowers, 1 set paper leaves, 1 paint transfer, 6 phrase strips, 2 postage stamps, 1 rabbit sticker, 2 circle tags, 2 wooden titles, 1 wordart. Poisson is a mixed media digital scrapbooking collection by Rachel Jefferies that coordinates with the April 2019 BYOC. This element pack includes 65 unique pieces ideal for digital and hybrid scrapbooking, digital artistry, art journaling, paper crafts and more. Jam packed with my signature mark making and lots of other hand made items including paint, doodles, sketches and more! Created at 300 DPI for optimum print results and saved in PNG format. An ABR Brush set is also included with this pack and encompasses the paint and stamped elements but please note that some of them are reduced in size for compatability with some older releases of Adobe Photoshop and Elements. Inspired by the awakening of mother earth, Spring Time digital scrapbook collection will help you document your everyday life spring memories. Shop Spring Time Elements by clicking "Add to Cart" button and start documenting your unique story today. Artsy Bits & Printables, 1 letter-sized pdf with 8 Pages, 8 transparent png files, letter size, printables pdf ready to print for you to do hybrid projects and art journal.